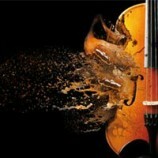 Video game music is becoming more popular and represents exciting opportunities for composers. With a lower barrier to entry than scoring TV or Film music, video game scoring could be a medium for new composers to thrive. 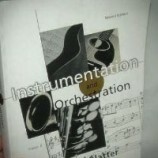 Here are 5 books that lay down the foundations of scoring video games. Aaron Marks is a highly influential industry leader who remains active in all aspects of game audio. Marks won Best Game Audio Article, Publication or Broadcast – Game Audio Network Guild Awards – 2002; and he is also an award-winning composer and sound designer (2004 Game Tunnel – Best Sound in an Independent Game of the Year Award – I of the Enemy). His knowledge is sought after and can help any game audio specialist grow in his/her field. Exhaustive, Indispensable resource for Game Audio – so that game audio professionals can do things like learn how to set up a studio, make a demo reel, find the work, bid on contracts, negotiate deals with clients and win the contracts. Technical considerations explained in detail so that game audio professionals can make sense of complicated systems, learn about the highly involved programming elements, and create high quality audio without a hitch. DVD includes audio samples, demos, interviews, and Dolby’s latest Sound Development Kit so that game composers and sound designers can benefit quickly and easily by porting to their own work. Videogames, web sites, and other new media are creating more opportunities for contemporary music writers than have ever existed before. In this book, you will learn to write effectively for these new forms, mastering the devices, sounds, and techniques for supporting stories and responding to user actions. 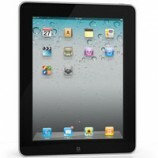 It details the technical and dramatic requirements necessary for each type of new media. In engaging language, illustrated by countless real-world examples and practical workshops, writers at all levels will find ways to create music for new markets, and find new opportunities for creative expression. Guided hands-on projects will help you create music in all these forms. 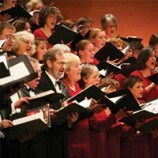 A CD of examples and practice files illustrates all concepts and lets you practice the techniques. Create demos and portfolios for getting clients. A distinguishing feature of video games is their interactivity, and sound plays an important role in this: a player’s actions can trigger dialogue, sound effects, ambient sound, and music. And yet game sound has been neglected in the growing literature on game studies. 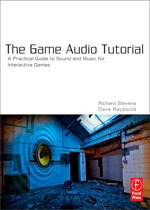 This book fills that gap, introducing readers to the many complex aspects of game audio, from its development in early games to theoretical discussions of immersion and realism. 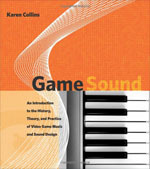 In Game Sound, Karen Collins draws on a range of sources–including composers, sound designers, voice-over actors and other industry professionals, Internet articles, fan sites, industry conferences, magazines, patent documents, and, of course, the games themselves–to offer a broad overview of the history, theory, and production practice of video game audio. Game Sound has two underlying themes: how and why games are different from or similar to film or other linear audiovisual media; and technology and the constraints it has placed on the production of game audio. Collins focuses first on the historical development of game audio, from penny arcades through the rise of home games and the recent rapid developments in the industry. 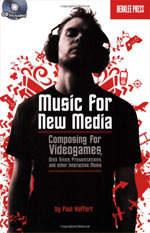 She then examines the production process for a contemporary game at a large game company, discussing the roles of composers, sound designers, voice talent, and audio programmers; considers the growing presence of licensed intellectual property (particularly popular music and films) in games; and explores the function of audio in games in theoretical terms. Finally, she discusses the difficulties posed by nonlinearity and interactivity for the composer of game music. 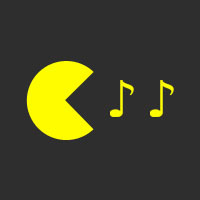 Get ready to step into the mysterious world of the video game sound designer and composer. Creating Music and Sound for Games examines the responsibilities associated with each of these roles and offers tips and insight for breaking into the business. With focused sections for each of these important roles, this book offers an insider’s look into how the sound designer and compositor fit into the game production team and how these roles interact with one another. You’ll cover the essential tools of the trade and will examine sound design and composition tips that can save you time and make you more efficient. Design and implement video game sound from beginning to end with this hands-on course in game audio. 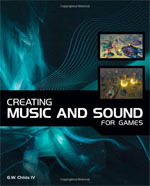 Music and sound effects speak to players on a deep level, and this book will show you how to design and implement powerful, interactive sound that measurably improves gameplay. 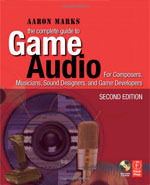 If you are a sound designer or composer and want to do more than just create audio elements and hand them over to someone else for insertion into the game, this book is for you. You’ll understand the game development process and implement vital audio experiences-not just create music loops or one-off sound effects. Is there a book that’s super awesome that I’ve missed? Maybe you’ve read a book above and want to share your experience with it? Why don’t you post about in the comments below.